Big school news this week: we had math lessons, twice even! We are definitely progressing now. At least that is how I choose to view it, otherwise I'm going to freak out at how far behind we actually are in some subjects. Overall for the week there was a definite increase in learning and quantifiable school work. It's going to be a slow process to get back up to full school days and I expect we will finally hit that mark around the time for Christmas break. Our timing, as always, is impeccable. Amber worked on quite a bit of biology, including experiments, this week and has moved so far ahead in this particular subject that she may be able to complete it before December. My goal has always been Christmas break, but it looks like she just might be science-free in December. We will be starting Earth Science & Astronomy in January, just in time to spend cold nights outside with the telescope. Again, our timing is spectacular. Spelling made it onto the schedule this week along with a full unit of Latin. Thankfully, it was a review unit in Latin that was up next, which worked out perfectly considering that Amber has not studied her Latin for several weeks. 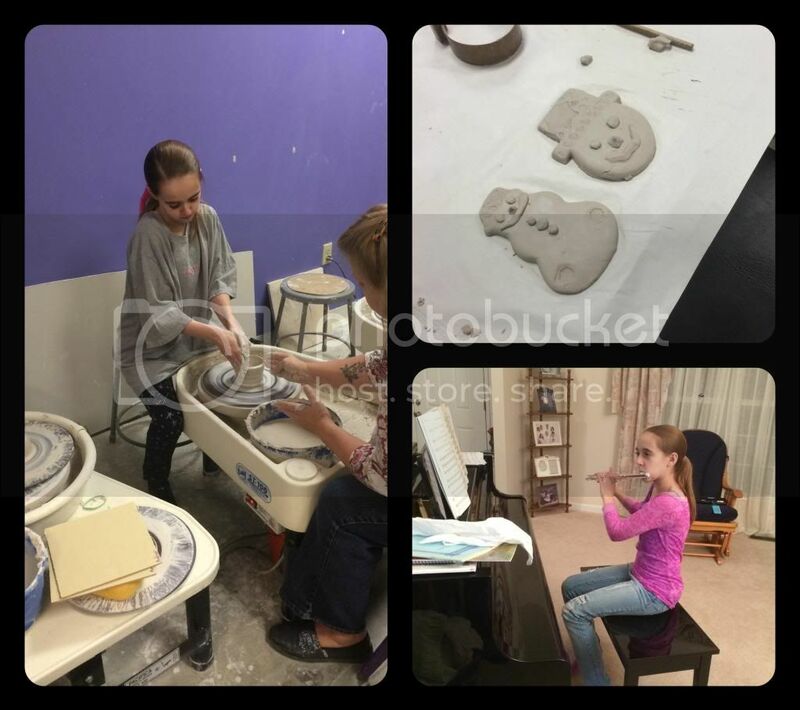 (LEFT) Amber working at the pottery wheel this session. I remembered a pic this time! (TOP-R) Amber's clay ornaments, step 1. (BOTTOM-R) Practicing flute on an "OK" tummy day. Amber capped off her literature study of the Aeneid with a final summary narration and then began reading her next literature book, Tales of Greek Heroes. We've had our first two discussion sessions over Greek Heroes and she is now reading the next section. At this rate, she will finish the reading portion sometime next week, but will still have to complete her writing work and the project for this book. Another major accomplishment for the week was that Amber attended ALL of her activities, including her remaining dance classes. Dance was a bit lackluster, but Amber did attend. Art class was another week working on the pottery wheel, and making Christmas ornaments out of clay using cookie cutters and other sharp implements. Eventually, Amber will be glazing all of these projects after their initial firing in the kiln. As for how Amber is doing healthwise, she feels pretty crummy right now but it's not the same as before. The low FODMAP diet, altered for Fructose Malabsorption, seemed to have been working as Amber reported to have less pain and she looked a whole lot better, until Sunday. Unfortunately, the Bactroban Amber has used for two treatment cycles was unable to completely clear up the bacterial infection on her foot. Last Friday evening the pediatrician added the antibiotic Augmentin to the treatment. That simple addition has wreaked havoc on Amber's digestive system. It is a necessary medication, but Amber is sicker than she's been in a couple of weeks due to the Augmentin. Now we wait for the antibiotic course to finish to see how the foot is doing and how well the digestive track likes the new diet. It's fairly frustrating for Amber to have such a limited diet but know we will not see any results for a while. However, we can't slack on the diet because it could make things even worse than they are. Such fun times around here. (LEFT) Even feeling crummy, she has a sense of humor. She's "wearing cheese". I had been spreading cheese on a cracker earlier that meal and my cracker shattered leaving me wearing cheeseball on my hand. I told Amber it was a new fad. She is playing along with the joke. 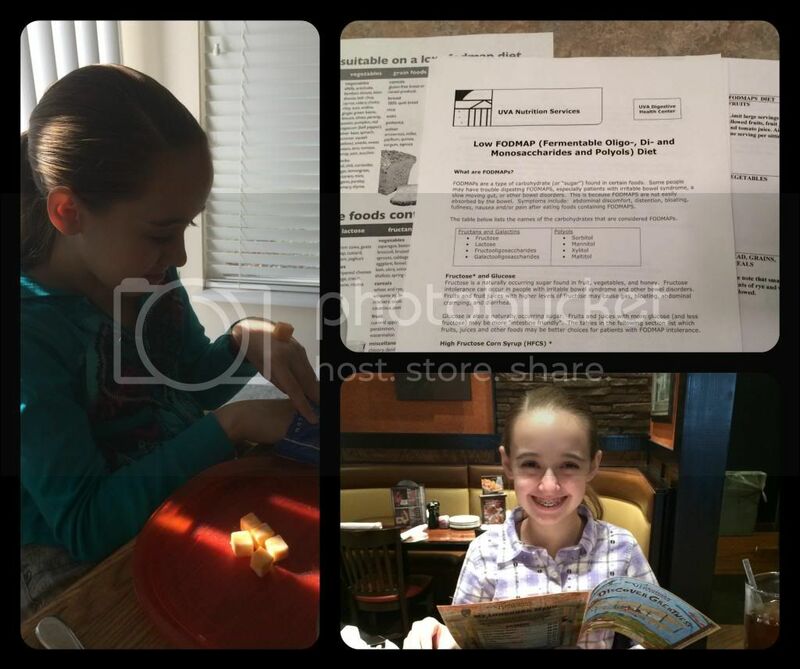 (TOP-R) Some of the paperwork we received on the Low FODMAP diet. It's basically a small list of foods that she might be able to eat, but there are no guarantees. (BOTTOM-R) The Augmentin was making her feel pretty crummy this day (note the huge bags under her eyes), but she still had a smile for me during our special "Mommy and Amber" lunch. Sometimes, you just gotta pause during errands and have steak for lunch. We did have a fantastic appointment with the dietician, finally! She actually knew her stuff, unlike so many dieticians that I have heard about from other parents of fructmal kids. The dietician at our GI practice even knew about the low FODMAP diet, has been to conferences on it, and suggested we use it instead of just a low fructose diet. I did eventually tell her that we already had Amber on the low FODMAP diet, but it was wonderful to get confirmation that it was the correct path. The dietician was also helpful in working through some inconsistencies between various FODMAP publications. Amber and I loved this dietician and feel blessed to have her as one of our resources. I prayed often before this appointment that we would have a good visit and that it would be productive. It also seems to indicate that perhaps we should stick with the GI practice where we currently take Amber. We cannot see this dietician without utilizing this GI practice. I'm not sure we will have as much success finding such a knowledgeable dietician if we go to another GI practice, even if it is at the research hospital. So, that's the big decision for the next couple of weeks. This November we are working on a thankfulness tree again. Fred and Amber drew the tree on poster board while I was at a Pampered Chef party this past weekend (I actually did something by myself... except my Mom was there too. LOL). Their tree is so much nicer than my best attempt last year, thus it just became their assignment for the future years (but Fred doesn't know that yet, shhh!). 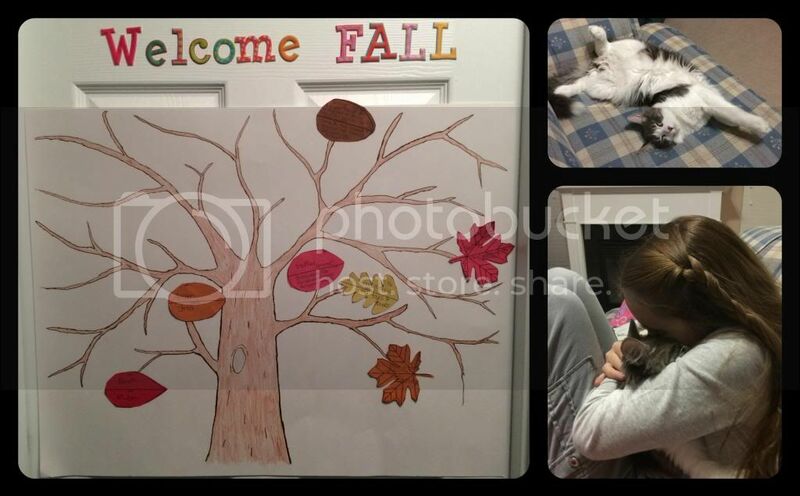 Amber was thankful this week for the usual things: the kitties, her family, her stuffed animals, her toys and book. Then on Thursday she changed her mindset entirely. She was thankful for "Enough money and a good job for my dad so we can afford the special food I need to eat." I have no clue where that one came from, but I'm proud of her none the less. We are indeed fortunate to be able to afford all the special grains and sweeteners needed to bake her food. Our new and improved Thankfullness Tree! (TOP-R) That crazy cat actually slept in that position for over an hour. We always find him in the oddest positions. This weekend, assuming Amber feels up to going, we plan to see Thor 2 (or whatever it's actual name is). Amber is obsessed with the Avengers and the various characters. Do not ask how many times we've watched the Avengers, Thor, or the Iron Man movies. She's not as thrilled with the Captain American movie, but the character is certainly enjoyed in the Avengers. I've also managed to keep Amber from finding out that the newest LEGO video game, Marvel Super Heroes, is now available. We'd like to make the game a Christmas present, but that might be pushing it. Nobody mention the game to Amber. Christy I just pray for you and Amber all the time. I know that the good Lord gives us what we can handle, but geez how much can little Amber's body take 8( I pray that the dietitian can really help out! Enjoy Thor2, not my thing but the kids love it! Thanks Melissa. As of this morning Amber is now off the Augmentin. It made her too sick. Now we wait to see if the foot healed enough, or if she needs another antibiotic. Fun times. I'm with Melissa. Keilee and I pray for Amber and you all every night. I know that everything will work out. I am glad that the food diet seems to be working well. And that you love your dietician. That is so important. I am amazed at all you accomplish even when she feels bad. Sweet hugs to your girl from us both. Wish we were closer so we could all hang out. Thank you. We love the Lego games here. I am so glad that dietician knows how to help with Amber's diet. Don't worry about falling behind. You are in a different season right now. Getting you little one healthy is the most important thing. I am glad that the new diet seems to be working. I keep praying that it does and that the infection clears up. My wife and I are going to see Ender's Game this weekend with some friends. The kids will have to wait until it comes out on DVD. Same with Thor 2, Ian is just to little to see it in the theatre. At home I won't worry about it. I can't put any sort of Christmas related items on my blog as my older two read all of my blog posts. It does sound like you're on the right track with Amber's diet. I'll continue to pray that she continues to improve! The Thanksgiving tree is very pretty! I personally can't figure out why my 17 yr old daughter likes Iron Man better than Thor! Having a medical team you trust is absolutely invaluable, so happy the dietician is a blessing! Hello. I read your blog regularly but this is my first comment and I hope it is okay to comment on your daughter's bacterial infection. Have you tried a natural doctor or an herbalist to supplement your MD visits? There are many antibacterial herbs and oils that may be used along with prescription medication to help treat an infections (like Peppermint oil, honey, tea tree). Our family uses both traditional and holistic medicine and switch back and forth when one thing is not working. If you don't have a naturopath in your area, a very good organic health food store may be able to give you advice on what herbs to choose. I hope she heals quickly so that more medication is not needed and her body can heal. As a Mom of 2 daughters, believe that there are times when lessons go very well, and times that life pulls you in other directions. There is no falling behind if you are going to stay on a homeschooling path. Once you step off the public school track, you have the wonderful ability to chart your own course. I am glad that Amber is feeling well enough to go to her classes this week! I also love your thankfulness tree. We've got ours up now, and Firecracker is the only child that seems to be thankful for something that isn't a toy so far! Hi! Your family seems very lovely! Your daughter seems like a sweetheart. I myself suffered all my life from fungus infections and scince lately I have been using coconut oil, just take a little bit and spread it on the infected area. This has worked wonders for me, and you could give it a try. I also like that it is very mild and gentle. Good luck! And I hope next week will be beter!